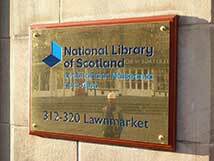 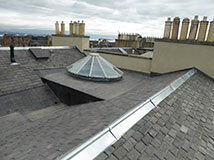 Our featured projects page is updated on a frequent basis. 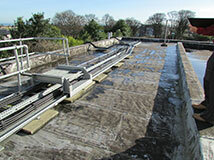 These photos shows location of library were general maintenance gutter and inspection works are required. 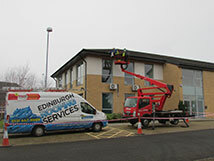 A cherry picker lorry is required to give safe access for minor gutter repairs and cleaning as per on site meeting with Craig Robertson. 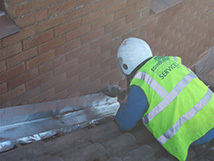 The main front elevation zinc formed gutter to be re-aligned as best we can by cherry picker lorry access along with cleaning gutters and water test outlets and downpipe and finally checking all gutter brackets and straps are in good order and fit for purpose as per on site instruction. 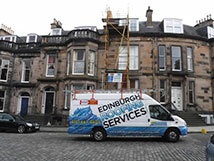 Roofing technicians cleaning and checking front elevation gutters and downpipe, carrying out water test to check free flowing. 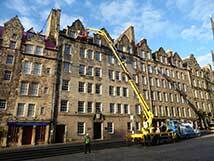 These photos show a large traditional tenement were refurbishment roof works are required as per on site meeting and inspection. 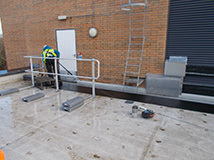 The main flat roof is to be completely uplifted and replaced with new High performance EPDM flat roof system with long life expectancy and 20 year insurance backed guarantee. 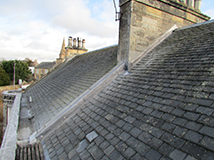 These photos show front elevation roof areas to be stripped and reslated with new Spanish slate and with all new lead work replacing mortar skews and badly worn zinc and lead work. 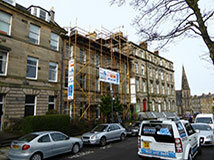 Large scaffolding in fixed position so that works can be carried out safely. 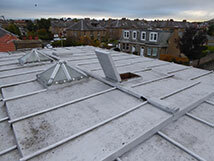 These photos show rear elevation roof areas stripped and reslated with new lead valley, Watergates as per estimate supplied all works was completed on time and within budget. 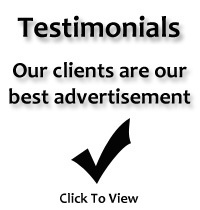 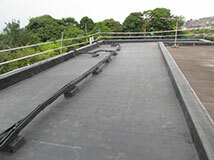 A large EPDM rubberbond flat roof system fitted to main flat roof areas, this flat roof comes with an insurance backed guarantee with a life expectancy of 60 years plus as per estimate supplied, all works was completed on time and within budget. 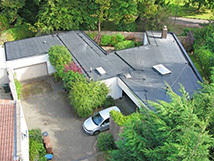 Front elevation roof areas stripped and reslated with new lead valley, Watergates as per estimate supplied all works was completed on time and within budget. 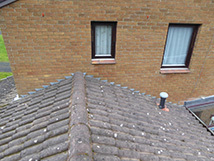 This photo shows a courtyard area were large cast iron box gutter has failed with wide spread corrosion and failing connecting lead flashing and full replacement is required for a long term repair. 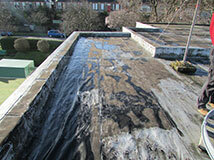 These photos show a failing gutter and large lead flashing, along with failing felt forming flat roof. 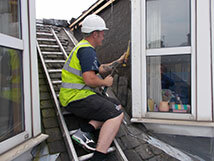 These photo show men installing new lead flashing and aluminium box gutter as part of gutter and flat roof and flashing refurbishment. 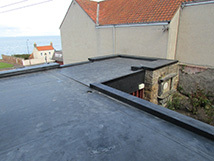 These photos show new flat roofs formed on feature window along with new lead flashing detail and new large black aluminium box gutters fitted on time and within budget. 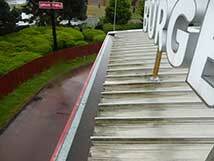 These photos show a Burger King Restaurant were large flood is occurring internally due to large rear box gutter being completely blocked with vegetation and debris preventing water from free flowing. 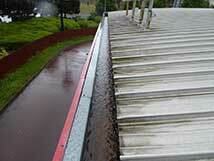 A large rear elevation gutter full of water due to blocked outlet leading to water ingress internally in large volume. 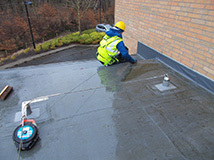 These photo show a roofing technician clearing blockage in large box gutter to rear and the outlet free flowing in very heavy rain conditions. 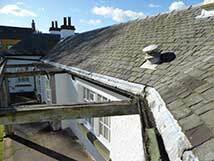 These photos show a large Victorian detached villa were general maintenance roof works are required as per on site inspection/meeting. 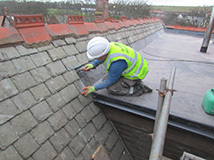 This photo shows a roofing technician carrying out slate repairs as part of general maintenance roof works by means of safety harnesses and fall arresters fixed to a secure point. 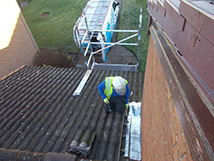 This photo shows a roofing technician cleaning out gutters of sun room as part of general maintenance roof works by means of 2 part ladder. 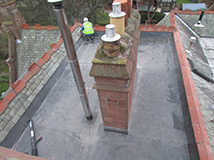 These photos show a large detached Victorian property were general maintenance roof works to slated elevations along with complete flat roof replacement works. 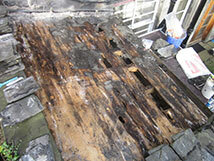 Timber decay is occurring as deck is soft underfoot due to ongoing water penetration. 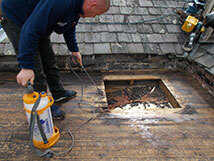 These photos show the flat roof uplifted and areas of exposed timber being treated to prevent further decay/rot. 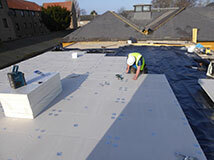 Spray applied adhesive being applied and membrane being laid neatly in to position. 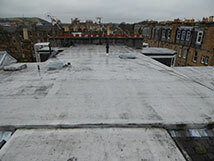 The photos show completed EPDM flat roof with 100mm insulation this was completed on time and within budget. 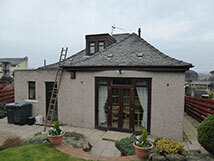 These photos show a large semi detached bungalow were rear elevation flat roof replacement works as per on site meeting. 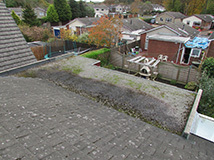 They	shows large rear elevation extension flat roof were large puddle is forming due to roof not running correctly this is to be fully uplifted and new timber deck fitted so that all water free flows off flat roof to gutter as discussed on site meeting. 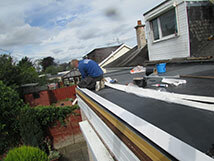 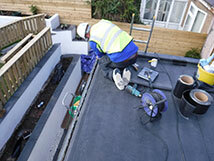 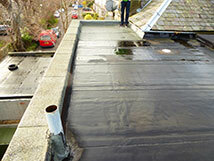 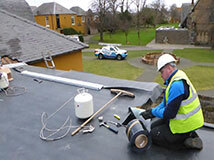 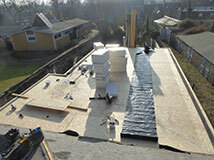 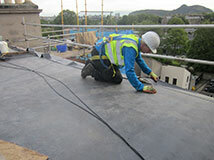 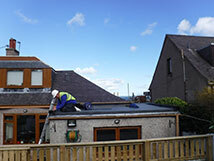 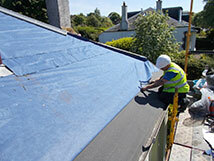 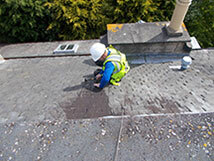 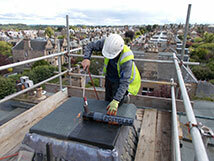 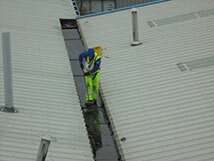 These photos show one of our roofing technicians on site carrying out EPDM flat roof works. 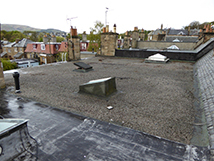 These photos show the flat roof uplifted and replaced with new EPDM flat roof with 100mm insulation as per estimate supplied it was finished on time and on budget. 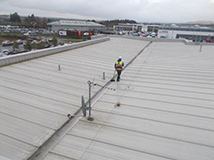 These photos show large unit forming pharmaceutical manufacturing complex were general maintenance roof works are required. 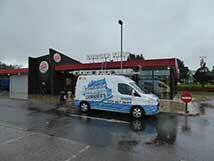 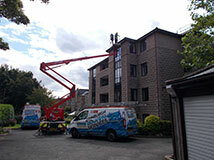 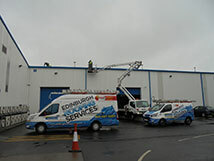 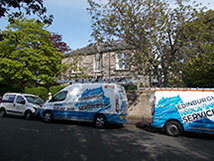 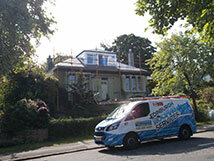 A cherry picker and company vehicles on site carrying out gutter and roof cleaning works. 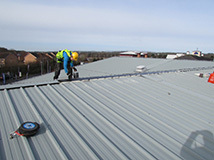 These photos show men on site carrying out roof and gutter cleaning by means of safety harnesses and fall arrester fixed to man safe roof anchor systems on warehouse roof areas so that works can be carried out safely. 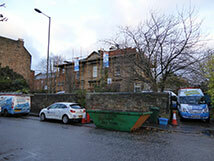 These photos show company vehicles on site for works and material storage. 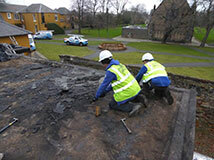 Roofing technicians remove old failing flat roof on maths bock so that new EPDM flat roof system can be fitted, along with 100mm insulation as per accepted works estimate. 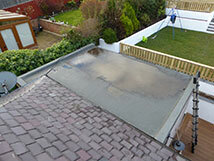 These photos show new timber decking fitted to concrete deck in preparation for vapour control barrier and insulation. 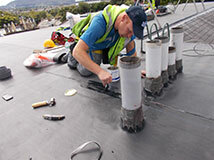 Roofing technicians fitting vapour control barrier and 100mm kingspan TR27 insulation board bay means of mechanical fixings as per estimate. 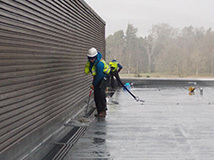 These photos show roofing technicians applying high performance EPDM Rubberbond fleece backed membrane by means of spray adhesive. 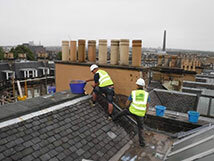 These photos show a large traditional tenement were full slate replacement is required along with new lead and zinc work at base along with lead gutter formed at base of turret and all ridges are to be replaced. 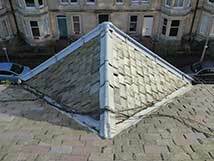 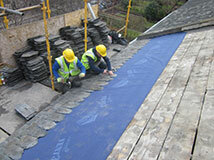 Full strip and reslate is required due to slated roof areas coming to end of lifespan. 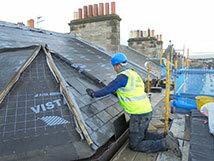 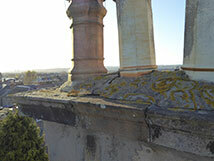 These photos show a front turret to have new lead work at base as part of roof replacement works. 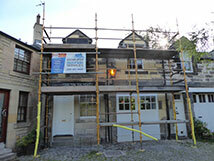 Scaffolding in position so that works can be carried out safely. 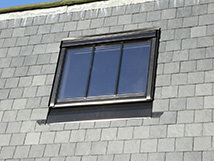 Slate is fitted to front elevation bay window areas as part of full strip and re-slate. 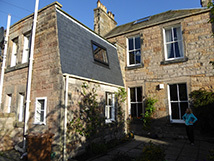 The front elevation feature turret slated back in neatly. 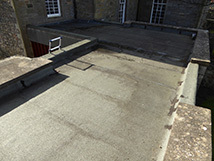 These photos show main front roof areas re-slated back in neatly with new zinc ridges and valleys along with new lead Watergates at wallhead. 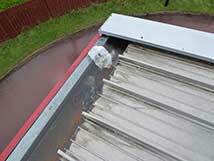 These photos show a large retail unit were general maintenance/repair works are required as per on site inspection and report supplied. 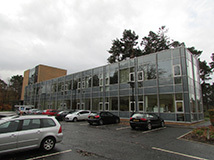 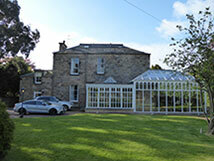 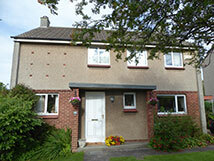 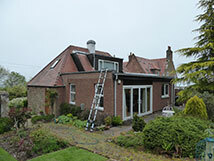 Work was to carried out on the front canopy gutter formed between canopy roof and main front elevation. 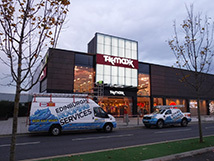 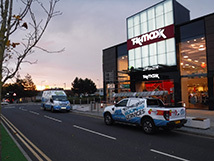 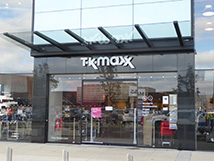 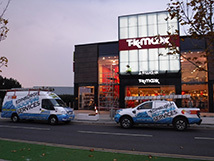 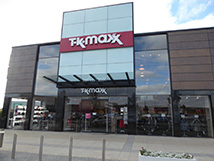 These photos show men on site with aluminium tower scaffolding with walk boards carry out repairs to TK Maxx entrance canopy. 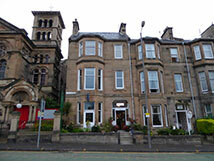 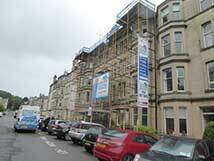 These photos show a large townhouse forming hotel were front elevation roof replacement works are required. 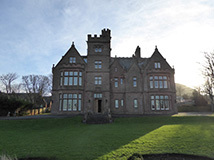 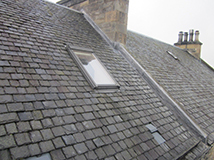 They show front elevation roof areas to be completely uplifted and replaced with new Spanish slate and new mortar skews along with new lead valleys and zinc ridges. 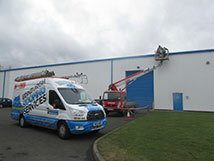 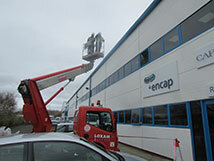 Scaffolding is erected in position so that works can be carried out safely along with our company vehicles on site. 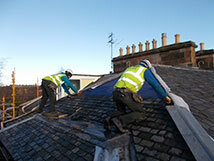 The photos show men working on front elevation roof areas slating all areas back in neatly. 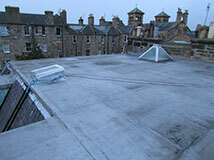 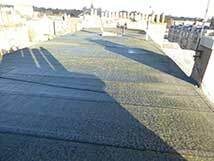 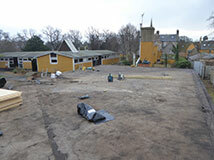 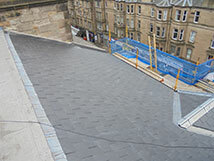 These photos show roof areas after all works have been completed on time and within budget. 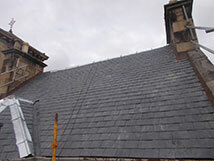 These photos show a large building forming church and halls were general roof works are to be carried out as part of general maintenance works as per site visit. 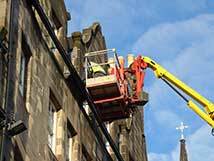 A large cherry picker lorry gives safe access to all church roof areas early in the morning to prevent traffic issues on main busy city centre road. 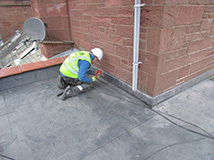 One of our roofing technicians is removing moss build up on main church roof areas by means of safety harnesses and fall arresters fixed to man safe roof anchors fixed on main roof areas. 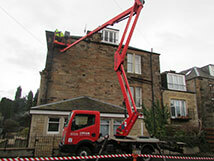 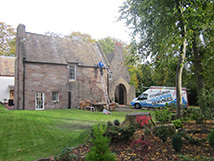 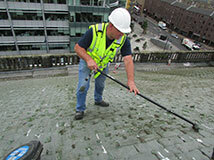 A large cherry picker lorry gives safe access to all church roof areas cleaning all gutters. 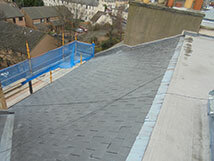 These photos show a house where garage flat roof replacement works are required. 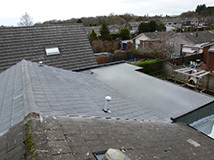 The	large detached garage flat roof has come to end of lifespan with widespread splitting and cracking present leading to water penetration internally. 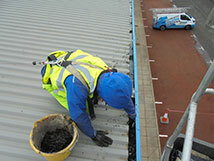 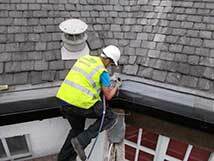 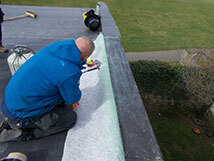 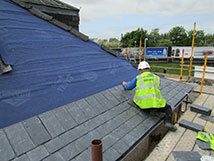 One of our roofing technicians is applying EPDM finishing tape at half round cast iron rhone/gutter. 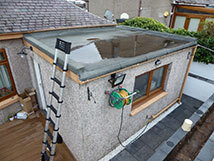 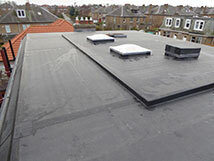 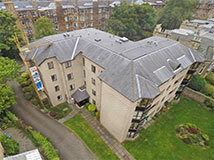 The new EPDM flat roof system with 20 year insurance backed gurantee with a life exspectancy of 60 years plus. 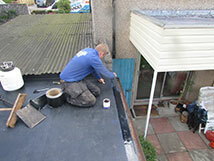 These photos show a semi detached bungalow were general maintenance roof works are required along with rear extension flat roof replacement works as per on site inspection. 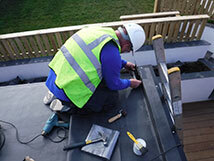 These photos show one of our roofing technicians apply EPDM Rubberbond flat roof system with plastisol aluminium trim detail. 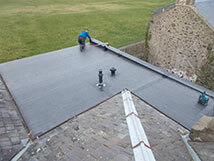 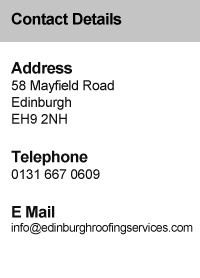 The new EPDM flat roof system with 20 year insurance backed guarantee with a life expectancy of 60 years plus. 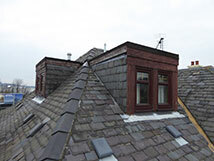 These photos show a large tenement were dormer refurbishment is required due to failing zinc Watergates formed at side of all 4 dormers. 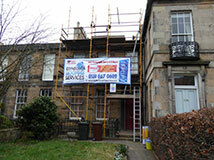 Scaffolding is put in position so that works can be carried out safely. 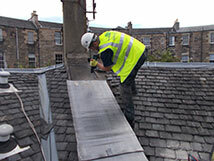 These photos show one of our roofing technicians slating side of dormer back in after new lead Watergates have been fitted. 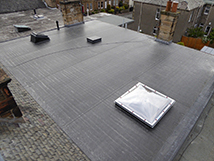 Aluminium reflective paint to main flat roof to prevent heat build up during summer months that can lead to damage over long period of time. 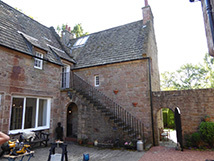 These photos show front elevation were previous pointing repairs are untidy and of poor finish and were older sections of pointing area failing and we recommend full replacement with new lime based mortar as a long term repair. 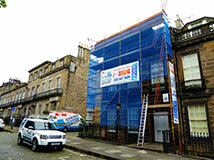 These photos show scaffolding in position so that works can be carried out safely. 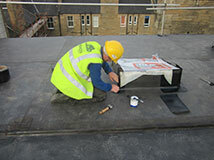 One of our lead workers is fitting lead cover flashing to mutual wallhead. 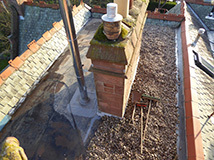 These photos show a mutual chimney rendered with Thermocromex lime based render system along with lead work covering mutual coping stones. 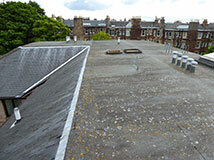 These photos show block forming flats where general roof works and maintenance roof works are required. 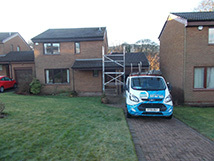 The photos show scaffolding in fixed position with company vehicle on site carrying out general maintenance roof works along with general chimney refurbishment works. 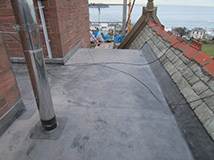 These photos show a wallhead chimney were render and flashings works are to be carried out due to Watergates due to water penetration internally. 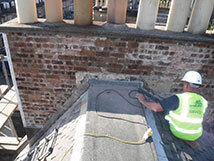 The photos show front elevation mutual chimney where render has been cut back to brick and lead works forming flashings and Watergates uplifted and prepared for new lead work and Thermocromex render system applied. 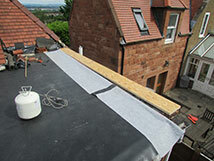 These photos show a cottage were flat roof forming rear extension roof is in need of replacement due to failing felt causing timber deck to warp and buckle over time. 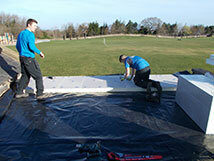 These photos show a EPDM membrane being fitted to wallhead areas in preparation for trim detail to be fitted. 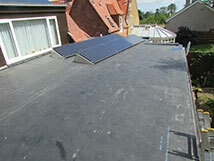 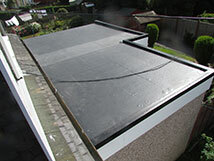 A new EPDM flat roof system fitted with 80mm insulation fitted along with reinstating solar panels. 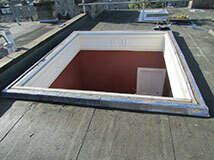 These photos show a Victorian property were flat roof and skylight works are required due to on site meeting. 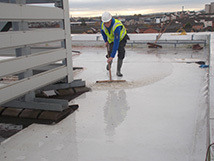 The main flat roof in very poor conditions with signs of water penetration at many areas due to zinc forming flat roof coming to end of lifespan. 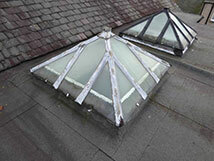 These photos show the main stairwell skylight/cupola were refurbishment is recommended due to old handmade non safety glass and failing badly perished glazing tape and cover flashings. 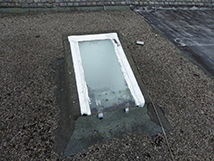 The photos show zinc formed flat roof replaced along with full refurbishment of main stairwell cupola with argon gas filled double glazed units fitted, this roof system comes with along life 20 year insurance backed guarantee. 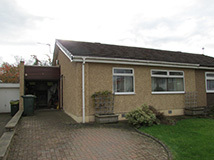 These photos show a detached bungalow were complete front elevation roof replacement along with front elevation dormer refurbishment works. 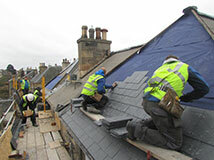 These photos show old slate and underfelt being stripped off in preparation of new slate and breathable underfelt being fitted as part of upgrade refurbishment works. 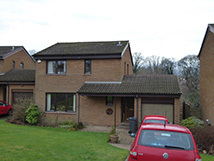 These photos show front elevation of bungalow after full roof refurbishment including front elevation dormer refurbishment with new UPVC fascias and gutters with new modern insulation fitted. 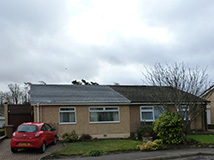 These photos show a large detached bungalow were complete roof renewal works is required due to failing roof areas due to poor quality workmanship and materials reaching end of life with two dormers to be completely refurbished as part of roof renewal works. 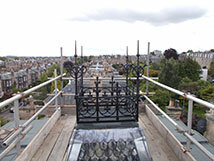 These photos show scaffolding in position so that complete roof renewal works can be carried out safely. 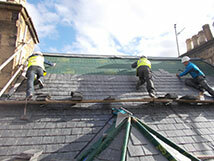 Old slated roof uplifted and new breathable membrane in position with new Spanish slate being double nailed in to position. 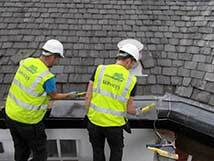 New UPVC fascias are fitted to dormer along with new lead formed Watergates and flashings and slate as part of complete roof refurbishment. 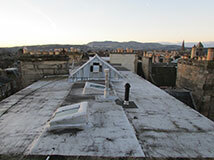 These photos show roof areas after roof renewal works being carried out. 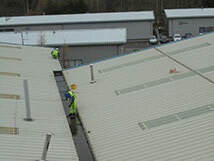 These photos show a large unit forming pharmaceutical manufacturing complex were general maintenance roof works are being carried out by means of cherry picker access. 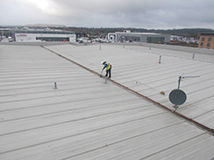 These photos show a large unit forming pharmaceutical manufacturing complex were general maintenance roof works are required. 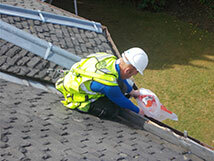 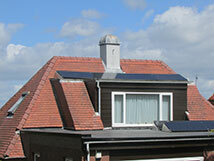 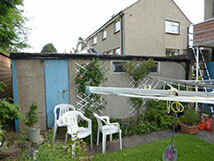 These photos show a house where skylight works and general maintenance roof works are required as per on site survey. 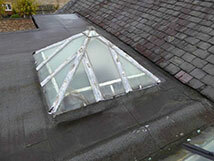 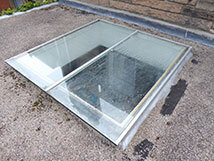 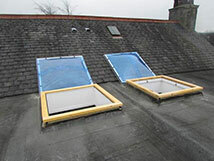 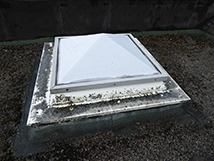 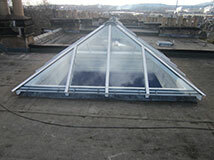 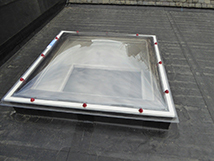 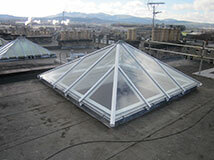 We we recommended a full refurbishment of the skylights due to severe old age. 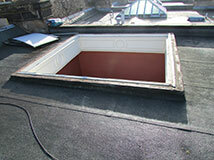 These photos show skylights removed and new timber frame fitted so new treble skinned polycarbonate dome can be fitted. 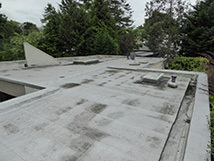 These photos show lower rear elevation outshot to have roof completely replaced with new lead formed Watergates and flashings along with green mineral felt formed flashings. 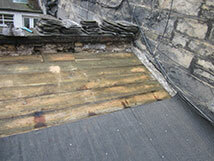 These photos show slate stripped off exposing rotten timber decking. 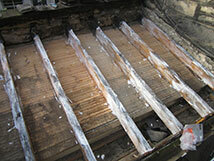 They show joists treated and internal roof areas sprayed with anti fungal and rot preservative to prevent further rot. 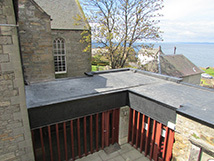 The roof was completely replaced with new heavy code lead Watergates and traditional scotch slate with green mineral felt flashings on wallheads. 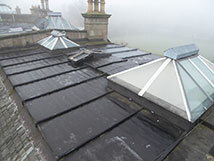 These photos show large a Victorian mansion house were general flat roof renewal is required due to water penetration due to failing flat roof fixed over original flat roof causing water to pond and penetrate internally. 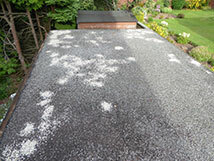 The EPDM flat roof system is failing with large volume of ballast pebbles. 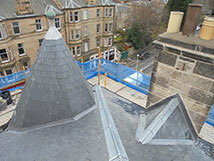 These photos show tower scaffolding in position so that works can be carried out safely and roof areas being slated back in using slate to match original building. 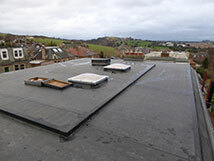 These photos show new EPDM flat roof system with 50mm insulation fitted and areas slated back in neatly. 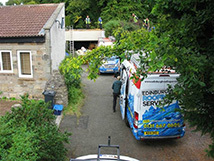 These photos show detached house were general maintenance and replacement of failing Watergates are required due to water ingress in heavy rain conditions and the lead Watergate with step flashing detail that is to be fully replaced as part of recommended roof works. 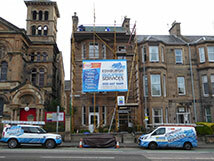 These photos show men and scaffolding on site with company vehicle so that works can be carried out safely. 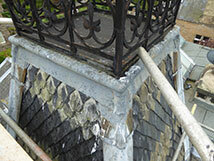 Tiles stripped back and lead Watergate with step flashing detail being replaced with new lead work as per repair. 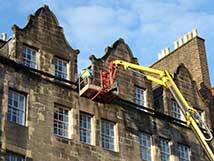 These photos show a large office block were general maintenance works are required by means of cherry picker lorry. 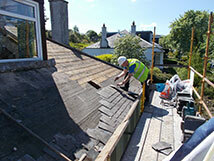 These photos show a detached property were general storm damage roof works are required after recent storm conditions. 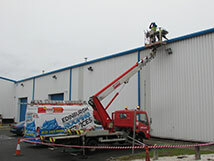 A cherry picker lorry is on site with men carrying out essential storm damage maintenance after recent storm Henry. 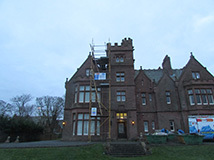 These photos show a large detached Victorian villa were nails holding slate in position have become badly corroded, this process is called nail sick and full replacement is recommended due to the severity of this. 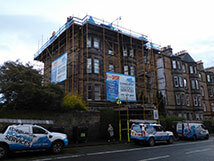 Large scaffolding in position so that works can be carried out safely. 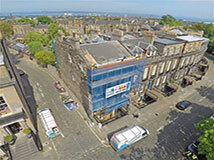 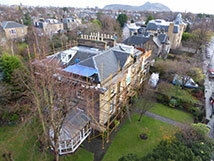 These photos show large scaffolding in position so that works can be carried out safely and men on site carrying full strip and re-slate with all new lead works forming all valleys and ridges and lead formed flat roofs, this job was part of a conservation refurbishment based on historic Scotland’s guide lines. 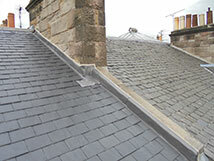 These photos show one our team fitting traditional scotch slate with high performance breathable membrane as part of a traditional roof system with a modern upgrade relating to underfelt allowing roof areas to breathe. 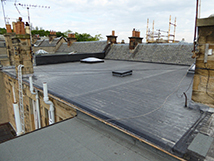 These photos show roof areas after all works completed which was on time and budget and site tidy and all scaffolding removed after works completed. 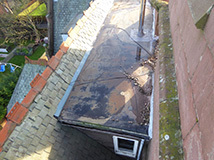 These photos show 2 semi detached houses where flat roof renewal works are required due to failing zinc formed flat roof due to severe old age. 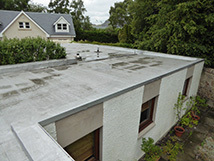 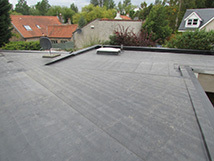 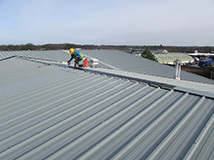 The large zinc formed flat roof that has come to end of life due to severe old age and full replacement is recommended due to its poor condition. 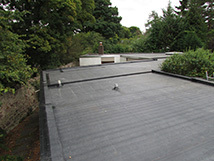 These photos show the large flat roof completely replaced with new EPDM high performance flat roof system with 100mm insulation, this roof system comes with a 20 year insurance backed guarantee with a life expectancy of 60 years plus. 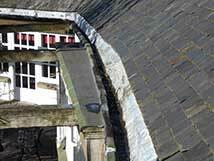 These photos shows a Victorian stable and servants complex forming houses were general maintenance roof works are required as per site meeting/inspection. 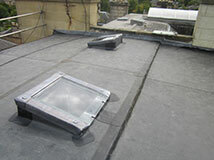 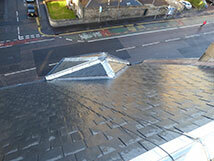 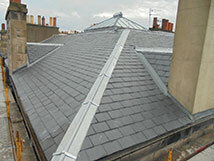 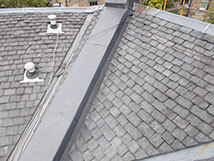 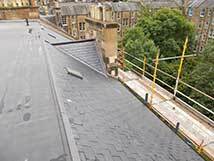 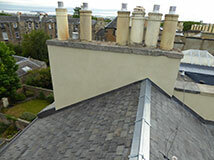 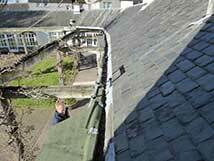 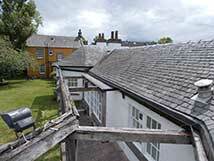 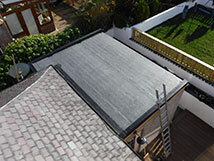 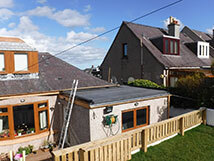 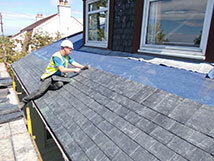 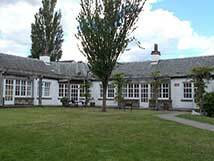 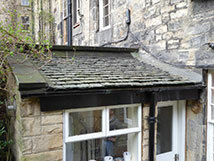 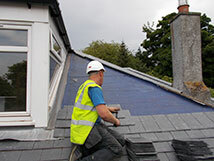 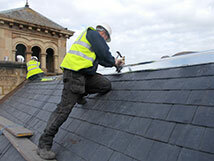 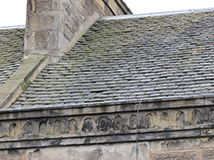 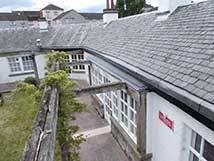 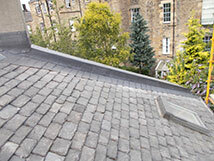 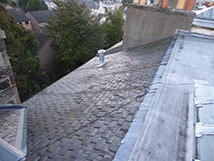 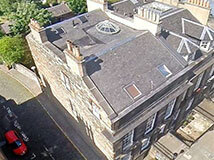 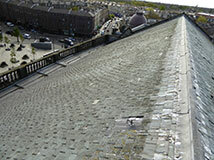 General maintenance roof works are required due missing and damaged slate are present. 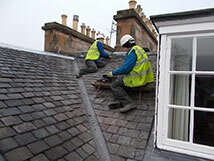 These photos show men on site replacing any missing and damaged slates by means of 3 part ladders and roof ladders. 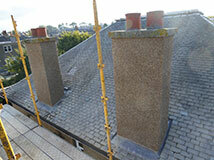 These photos show a house were general chimney and roof works are required as per site meeting. 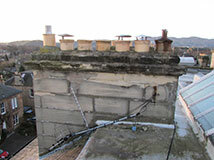 They show 2 gable elevation chimneys were roughcasting is failing with cracks and sections becoming loose, and lead work at base perished due to severe old age. 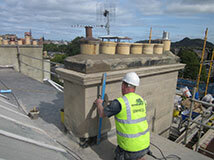 These photos show men stripping failing roughcasting with large hammer action drills, taking all roughcasting off and preparing for new mortar and roughcasting chips. 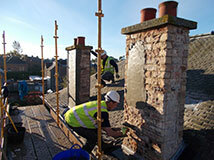 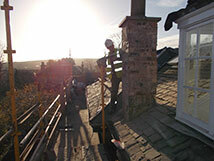 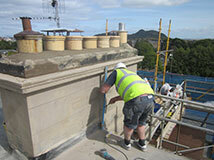 These photos show new render being applied to newly stripped chimneys. 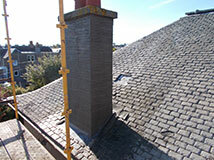 They show a chimney with first scratchcoat of good sound mortar applied, ready for second coat and then roughcasting chips to be applied. 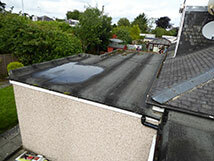 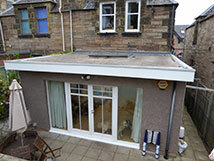 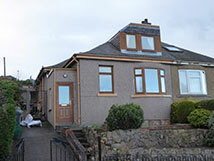 These photos show a large detached bungalow were flat roof has come to end of lifespan and is need of full replacement. 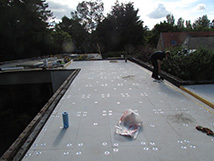 These photos show 100mm insulation fitted to large flat roof area, ready for new High performance EPDM flat roof to be fitted. 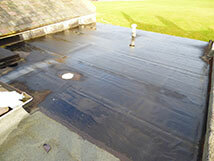 These photos show works completed and new EPDM flat roof with long life 20 year insurance backed guarantee. 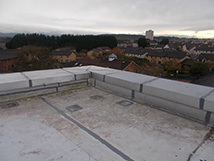 These photos show a large sports hall complex were general flat roof works are required due to failing flat roof surfaces. 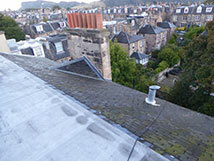 The photos show a flat roof to be uplifted and fully replaced working around existing mast pipe/wiring as discussed on site meeting. 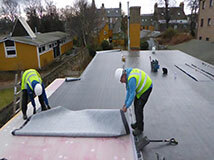 These photos show a large flat roof section over sports hall replaced with 50mm high performance insulation and with new High performance EPDM Rubberbond fleecebacked singly ply membrane, with long life 20 year insurance backed guarantee with life expectancy of 60 years plus. 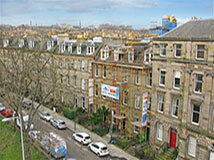 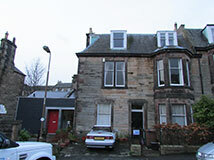 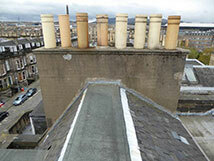 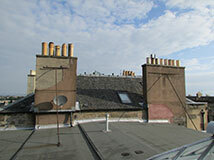 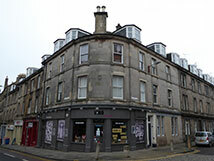 These photos show a large tenement were general roof works are required as per site visit. 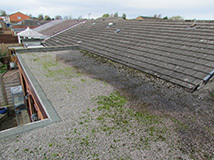 The photos show a large flat roof that is failing with widespread splitting and cracking letting water penetrate internally. 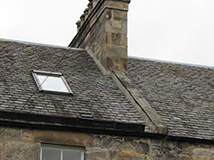 These photos show failing stone on front elevation 7 vent chimney, this needs repaired straight away due to loose stone decay. 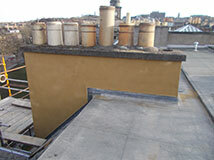 These photos shows specialist lime base lithumix render system applied as part of chimney repair works. 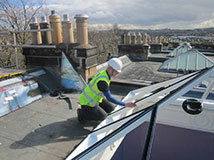 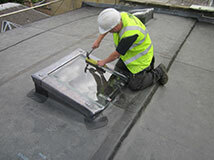 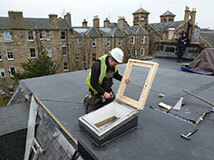 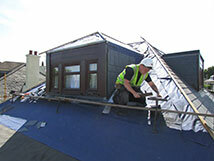 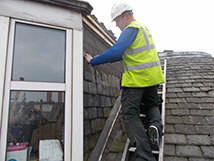 These photos show lead flashing details being finished off on new skylights that we have fitted. 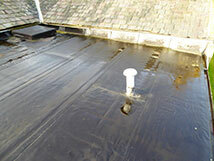 These photos show a large block were flat roof to be refurbished due to flat roof surface starting to fail with signs of water penetration due to failing seams and edges. 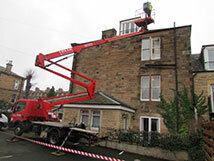 These photos show a cherry picker lorry and scaffolding in position so that all works can be carried out safely. 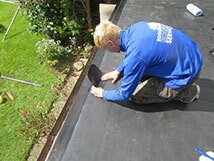 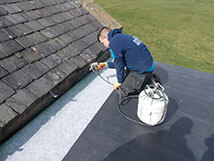 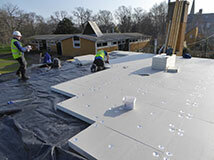 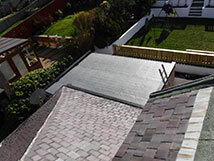 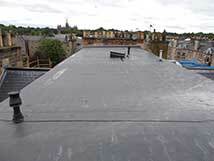 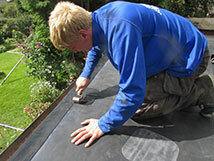 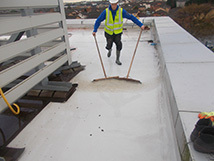 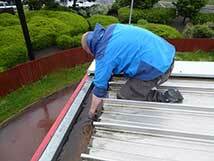 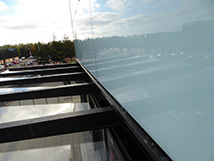 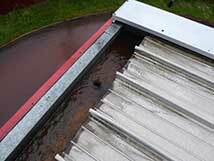 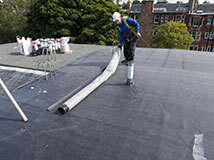 A roofing technician applys adhesive primer so that EPDM flat roof system can be fitted. 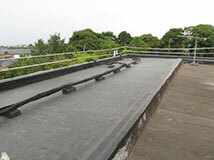 This photo shows EPDM flat roof works completed. 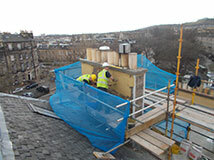 These photos show scaffolding giving safe access to flat roof on turret and feature railing that have signs of repairs carried out previously, these need fully removed and flat has to be completely replaced. 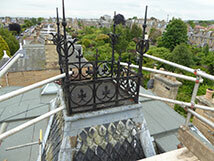 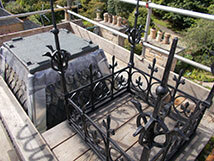 These photos show feature turret railings removed and felt work carried out and all turret feature works completed. 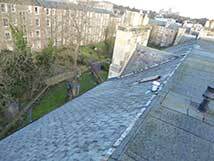 These photos show 2 semi detached Victorian properties in Morningside were full roof renewal along with attic conversions are to take place. 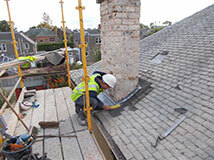 These photos show all slate removed and men and materials on site working on full roof replacement along with 2 new attic conversions. 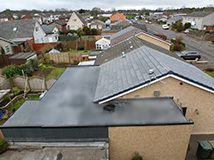 These photos show all roof areas replaced with new Spanish slate with 100 year guarantee and new EPDM flat roof system fitted along with new insulation along with new skylights and double glazed skylights formed on new attic conversations all works was on time and within budget. 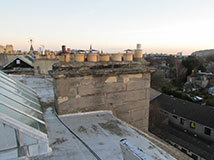 Carlton Terrace (Edinburgh) - These photos show a large town house were roof areas are to be completely replaced as part of recommended roof replacement. 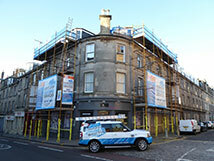 These photos show scaffolding in place and men on site working on full roof replacement. 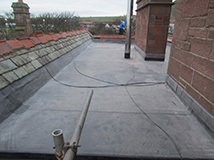 These photos show roof areas completely re-slated along with new specialist lime based mortar system applied to wallhead chimney (Thermocromex) and new Rubberbond EPDM flat roof system all roof areas come with a long life insurance backed 20 year guarantee. 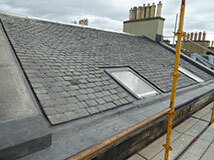 These photos show all roof areas completed with new lead work and slate work, this building was Historic Scotland approved scope of works and was on time and within budget. 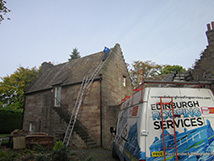 Seton Place (Edinburgh) - These photos show a large semi detached Victorian property were general roof and chimney works are required. 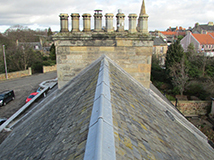 Two large gable elevation chimney where stone and render repairs and pointing are failing due to weathering over long period of time. 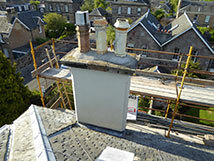 These photos show chimney after specialist lime based Thermocromex render system applied along with new lead works at base. 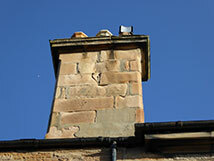 This photo shows chimney pot bedding mortar, where mortar has failed leading to movement in pots in high winds. 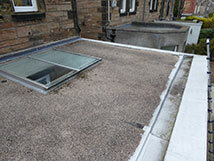 Craiglea Drive (Edinburgh) - These photos show a house where general flat roof replacement is recommended due to failing felt forming roof due to old age.The felt has failed and replacement is recommended as per site meeting. 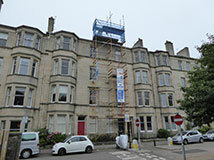 Scaffolding was erected in position for safe access for roof replacement works. 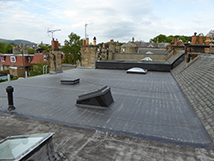 These photos show new high performance EPDM Rubberbond flat roof with insurance backed 20 year guarantee with a life expectancy of 60 years plus. 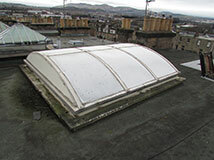 A large treble skinned dome in fixed position. 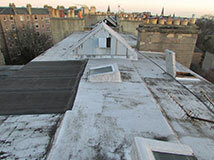 Wilfred Terrace (Edinburgh) - These photos shows lower rear elevation were general roof works are recommended based on failing felt with no insulation and poorly designed skylight on flat roof. 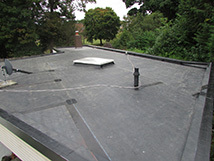 These photos shows new high performance Rubberbond EPDM flat roof system with 100mm Kingspan TR27 insulation, along with new double glazed pyramid style skylight. 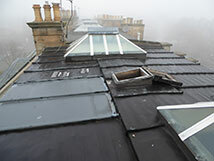 The Grange (Edinburgh) - These photos show a Victorian property in the Grange in Edinburgh The photos shows rear lower elevation outshot to have new velux conservation window fitted along with new slate. 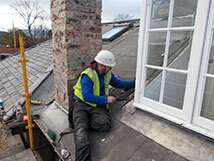 These photos show lower rear elevation re-slated along with large conservation velux window fitted. 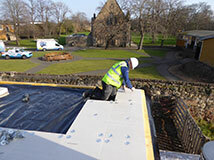 Preston Grange Parish Church - These photos show Preston Church where flat roof works are required to lower extension flat roof due to water penetration and failing felt due to severe old age. 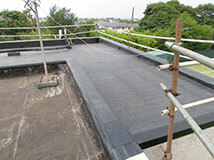 This photo shows new EPDM Single ply flat roof system with high performance 100mm Kingspan TR27 insulation in position after old defective felt formed flat roof has been removed. 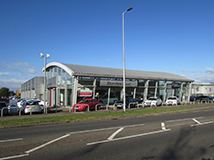 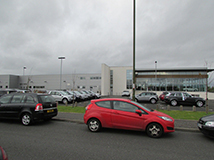 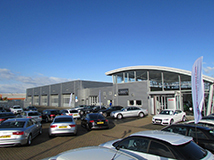 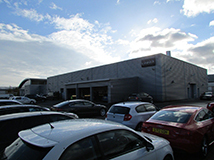 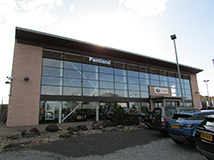 Pentland Motor Company - These photos show a large car showroom were general maintenance roof works are required as part of general maintenance required for this style of building. 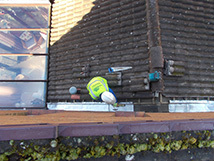 These photos show a roofing technician on roof areas attached to main safe system, cleaning out large centre gutter formed on roof areas. 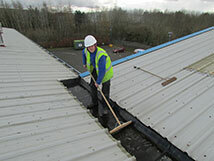 Dundee Audi - These photos shows large car showroom were general maintenance roof works have been carried out as part of general maintenance required for this style of building, the roof areas have man safe rope system on all roof areas for works to be carried out safely. 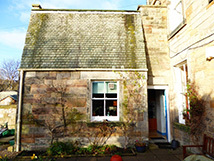 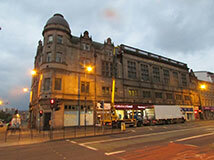 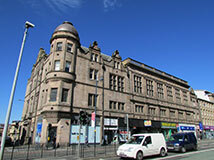 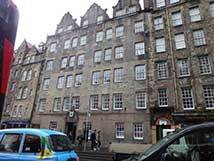 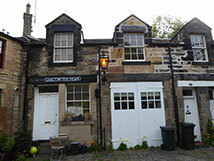 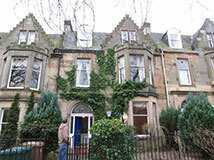 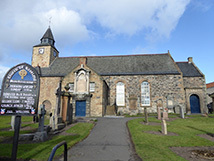 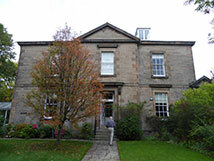 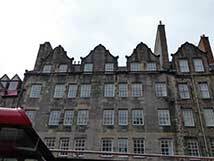 A Listed Building in conservation area in Edinburgh. 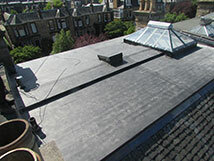 A large Victorian townhouse where general roof renewal is required due to nails on roof rotting completely away (nail sick) letting slate slip and become out of position also there is no underslating felt at all on roof areas. 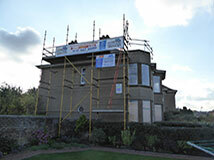 Scaffolding was erected in position so that all roof works can be carried out safely. 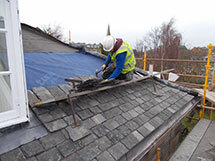 The front and rear of the property was completely stripped with new underfelt in position, so that scotch slate is being dressed and sized and prepared for use. 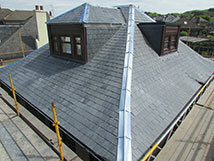 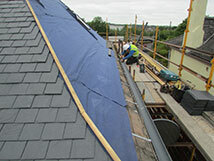 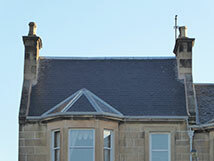 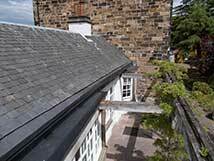 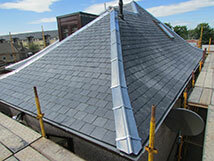 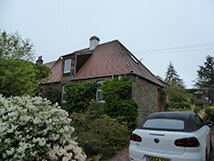 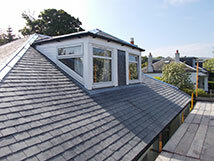 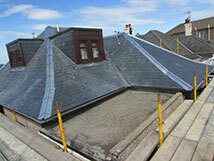 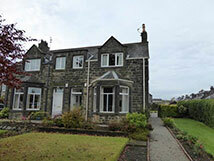 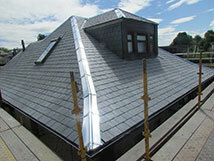 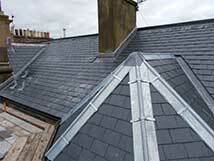 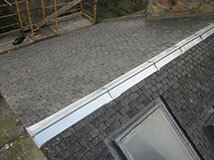 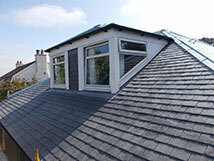 The property was completely re-slated with traditional scotch slate with new zinc ridge in fixed position. 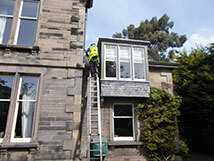 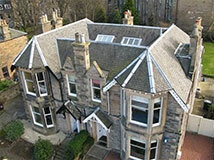 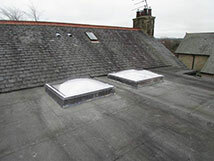 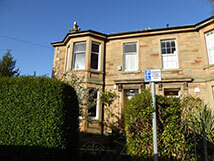 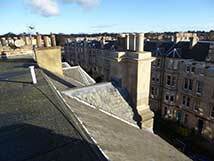 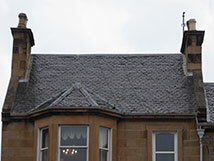 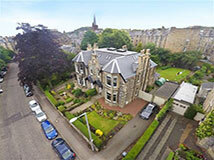 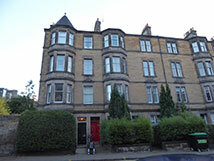 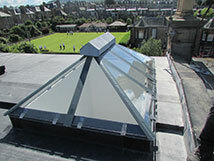 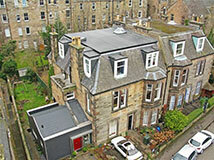 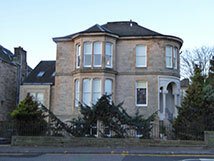 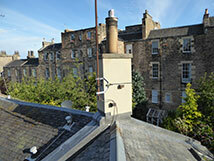 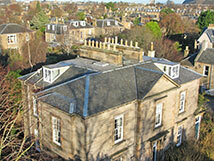 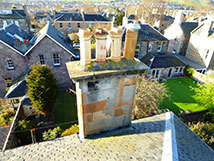 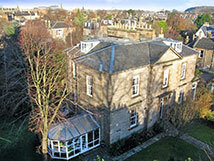 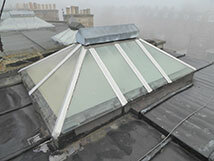 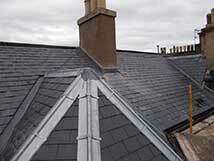 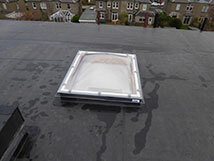 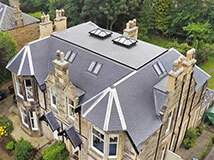 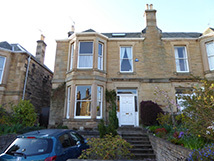 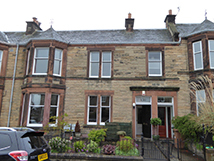 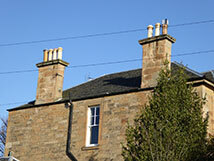 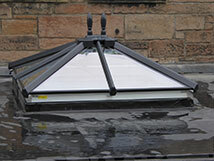 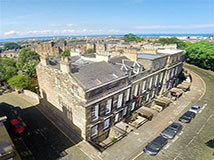 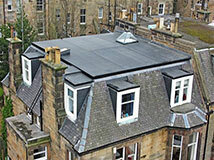 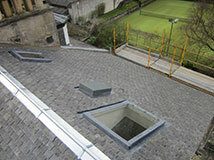 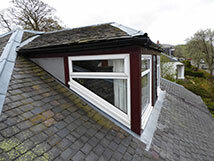 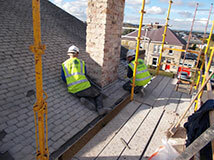 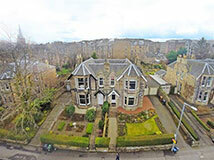 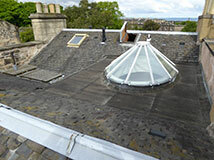 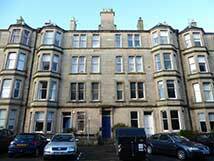 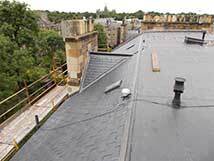 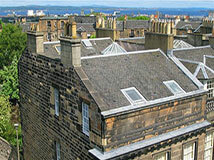 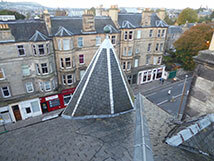 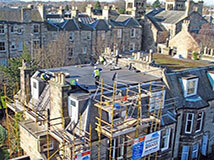 Large Victorian townhouse in Murrayfield area were general skylight and refurbishment of roof areas as part of recommended maintenance roof works. 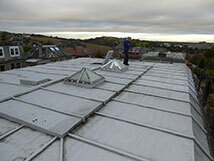 The failing polycarbonate barrel dome was removed and prepared for new lead apron flashing. 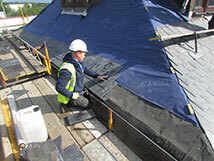 New lead flashing fixed in position ready for new timber frame cupola to be fitted. 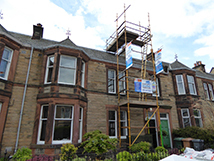 A new timber frame being built in position, ready for new double glazed argon gas filled units to be fitted to prevent heat loss. 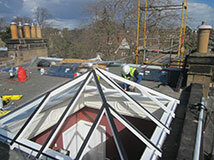 The photos below show a completed timber frame double glazed cupola and a new polycarbonate dome fitted with flat roof alterations. 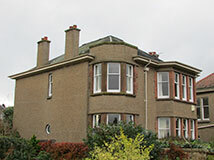 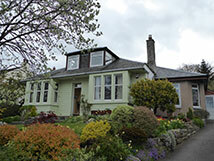 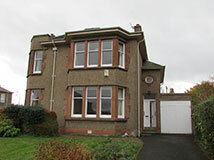 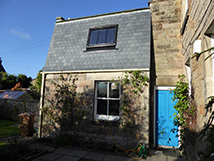 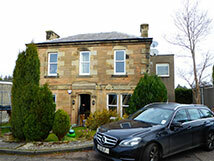 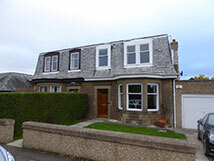 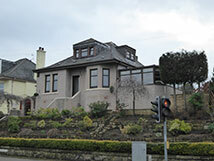 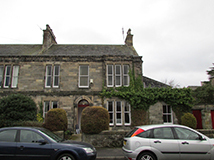 Victorian property in Grange (Edinburgh) where flat roofs and dormers need refurbished due to failing felt forming flat roof and failing timber and paint on dormers. 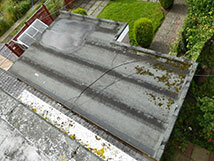 Large splits and cracks are present all over flat roof due to felt coming to end of life due to severe old age and poor quality roof repairs over the years. 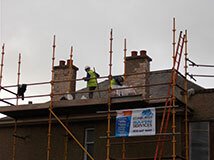 This photos below shows scaffolding erected and men on site preparing for roof and dormer replacement works and men working on site carrying out roof and dormer replacement works as per detailed estimate supplied. 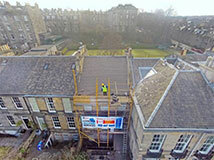 The photos below show scaffolding removed and new EPDM with 100mm insulation and skylights with full refurbishment of all dormers on all elevations. 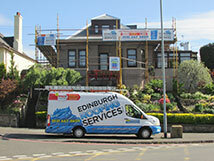 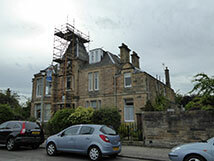 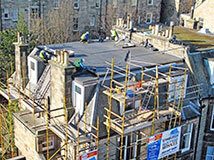 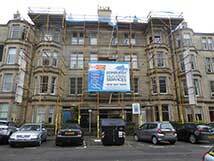 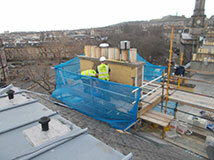 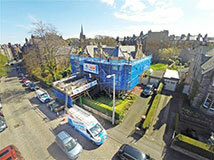 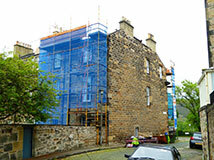 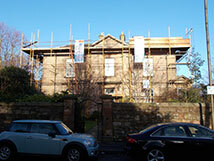 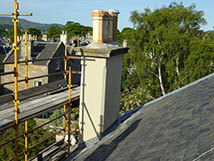 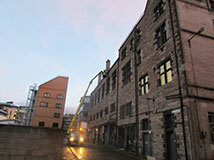 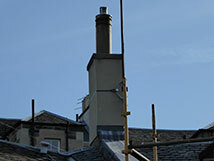 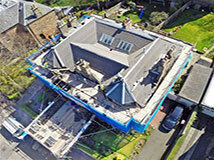 Newtown (Edinburgh) - Large scaffolding in position so that roof and chimney works can be carried out safely. 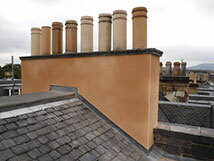 The photos below show workmen applying specialist lime based thermocromex render system to chimneys as part of refurbishment works. 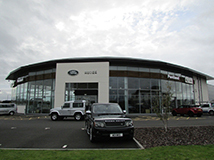 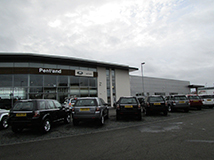 Pentland Rover - Perth - Large Land Rover car showroom were general ridge repair roof works are required as part of general maintenance required for this style of building. 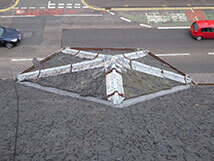 Section of ridge where insulation venting packing has come free letting water penetrate in high driving rain conditions. 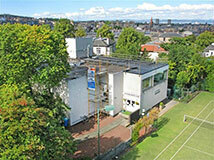 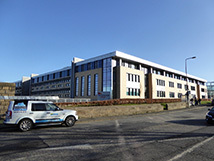 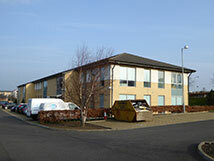 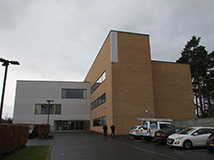 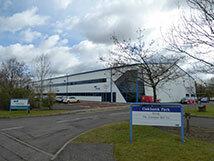 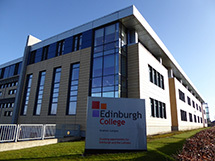 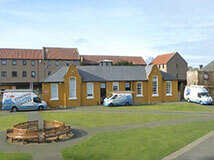 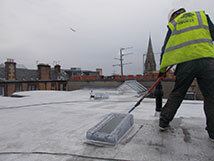 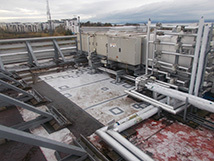 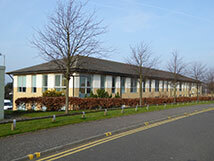 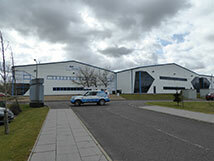 Edinburgh College - Granton Campus - Maintenance roof works and repair works were carried out. 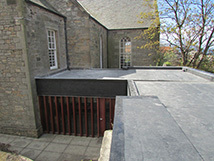 Large volume of water collection on flat roof areas above office to side of boardroom and the boardroom itself had to be shifted so that repairs could be carried out. 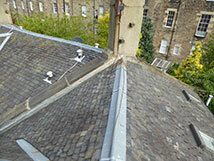 Roof areas to office to side of boardroom where repairs have been carried out to failing flat roof and cladding on wallhead as per estimate. 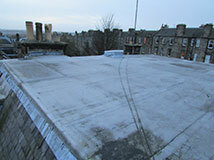 Roof areas above boardroom after repairs carried out to unit bases and flat roof membrane. 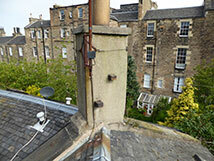 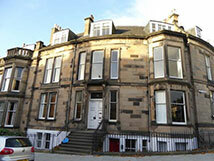 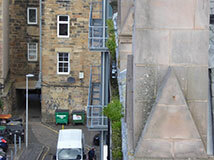 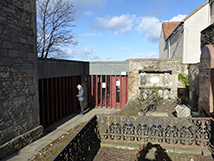 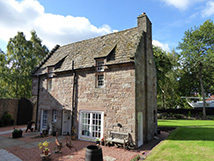 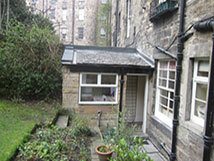 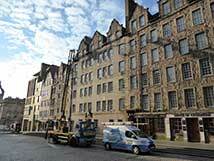 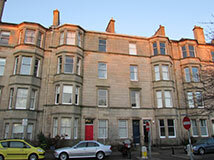 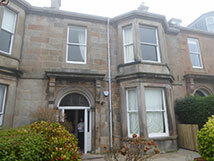 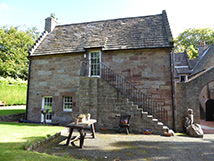 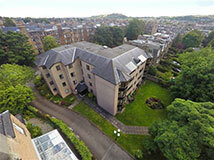 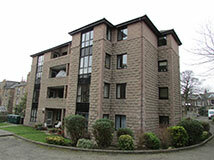 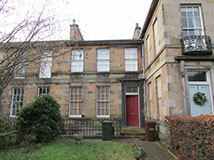 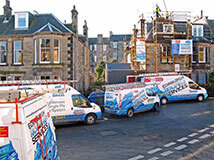 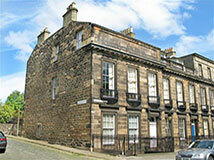 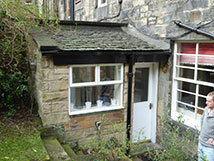 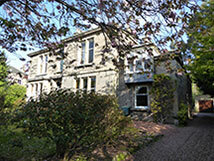 Property in Edinburgh where mortar skews were removed and new lead Watergates are fitted with long life guarantee. 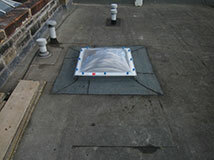 Watergate with code 5 overcloak cover flashings fitted and roof areas slated back in neatly. 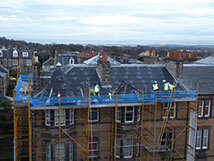 Large block forming Charles Darwin house were general roof works and maintenance works are required as per site meeting. 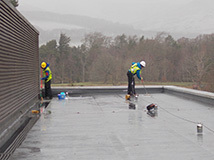 Large flat roof formed with single ply membrane were gutter cleaning and flat roof cleaning as part of general maintenance. 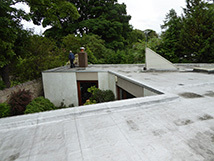 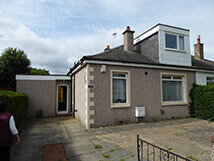 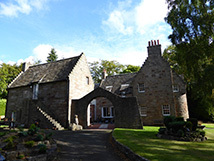 Property in Balerno where general flat roof and recommended tiled roof replacement are to take place as per on site instruction. 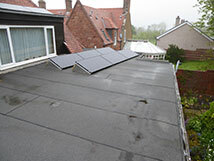 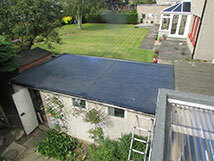 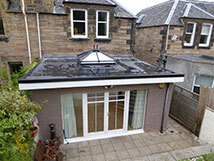 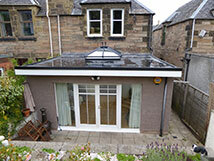 The roof was completely replaced with new tiles and EPDM flat roof with 100mm insulation.